Comanche Indians, a roving and war-like tribe of North American Indians of the Shoshone family who, when first known, inhabited the region from the headwaters of the Brazos and Colorado rivers to those of the Arkansas and Missouri, some of their bands penetrating to Santa Fe, in New Mexico, and to Durango, in Mexico. The Spaniards and the tribes on the central plains, like the Pawnees, felt their power in war from an early period. They called themselves by a name signifying "live people," believed in one supreme Father, and claim to have come from towards the setting sun. The tribe is divided into several bands, and all are expert horsemen. The French in Louisiana first penetrated their country in 1718, buying horses from them, and in 1724 made a treaty with them. They were then numerous. One village visited by the French had 140 lodges, containing 1,500 women, 2,000 children, and 800 warriors. Until 1783, they had long and bloody wars with the Spaniards, when, their great war-chief being slain, a peace was established. They numbered 5,000 in 1780. In 1816 they lost 4,000 of their population by small-pox. As late as 1847 their number was estimated at 10,000, with over 2,000 warriors; in 1872, a little over 4,000. In 1899 there were 1,553 at the Kiowa agency in Oklahoma. 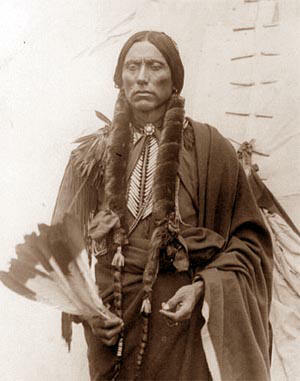 They did not adjust well to life on the reservation, and tensions remained high well into the 1900's.